= Ariocarpus retusus subs. horacekii Halda & Panar. Origin and Habitat: South of Matehuala, San Luis Potosí, Mexico. Description: Ariocarpus retusus subs. horacekii differs from the standard Ariocarpus retusus subs. trigonus only for its smaller body, all the other characteristics, namely tubercles shape and flowers colour clearly show that they are conspecific. 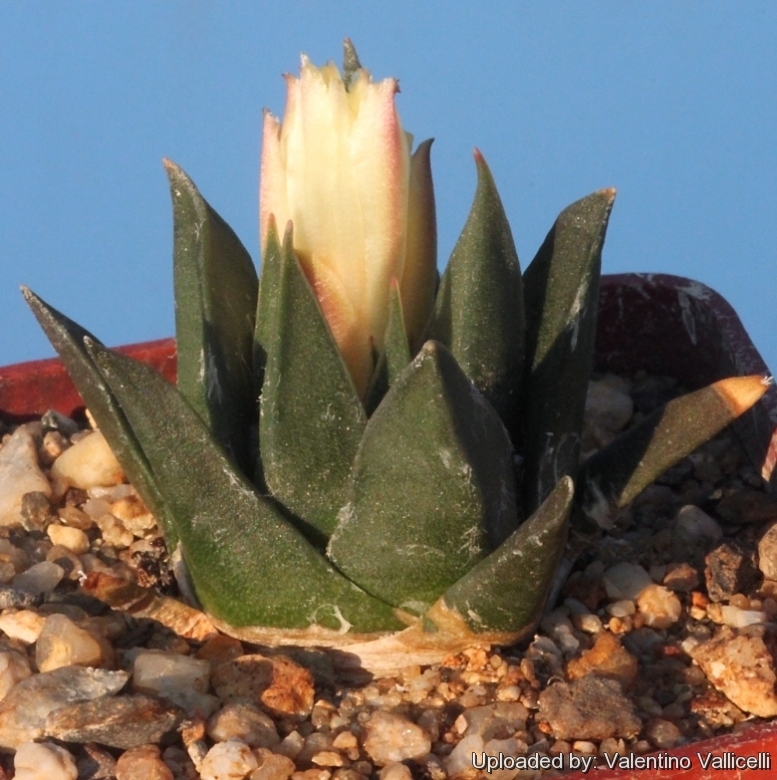 Ariocarpus trigonus is quite variable and has received numerous unnecessary names of no botanical value, representing no more than local phenotypes: Ariocarpus retusus subs. horacekii one of them. Stem: Globose, more or less depressed, rounded on top, mostly yellowish-green. Tubercles: Upright yellow/brownish grey, divergent, not closely set or basally compressed, acute at the apices, flattened and smooth adaxially, not fissured, strongly incurved, usually twice as long as wide. Areoles: It bears only small basal areoles. Blooming season: Flowers come in late autumn or early winter. Cultivation and Propagation: Ariocarpus retusus subs. horacekii is not too difficult in a greenhouse, although it grows extremely slowly (it starts blooming at the age of 8-12 years). Repotting: The plants need deep pots to accommodate the napiform unit formed by the stem base and the rootstock (or they will often simply crack your pots). Generally, they should be repotted frequently at least every other year in order to provide fresh soil. However, old plants become senile and have a tendency to succumb to disease and a weak root system. At this stage, as is well known, they die suddenly. So, after they reach 10-15 cm in diameter grow them slowly, and adopt a new repotting period, using intervals of every 3 years. Additionally grow them under drier conditions or with stronger sunlight. However, repotting doesn't necessarily mean they'll need larger containers.